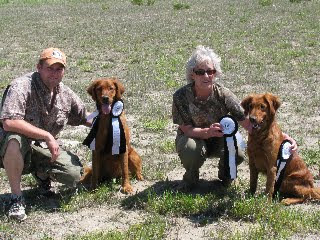 Congratulations to Teya (and Barbara) and Cowboy (and Nick) for achieving their Started Hunting Retriever titles at Lake Ontario's test a few weeks ago in Pontypool. Teya and Cowboy are Drake "kids" and very nice young dogs. Barbara and Nick have done a great job getting them to this point in their training. Thanks, Trudy, for the lovely pictures!